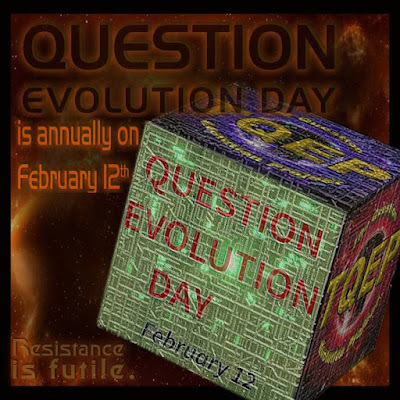 Question Evolution Day has several purposes, not the least of which is to prompt people to take a stand for freedoms, including speech, intellectual, and academic. Further, we hope to encourage people to examine what they've been taught about minerals-to-microbiologist evolution. They are likely to see that evolutionary dogma is saturated with opinions stated as scientific facts and just-so stories, but very little actual evidence. Darwin's Cheerleaders™ often use propaganda tricks with word definitions, especially conflating evolution with science (such as saying that biblical creationists "hate science" because we deny common ancestor evolution). The reality is that many creationist scientists are fully credentialed, appreciating science and working in their fields. Another conflation is conflating any sort of change with Darwin's concepts and calling it evolution. Not true. Worse, evolutionary scientists and their sycophantic press are often unsure of their own definitions — especially of new words and phrases. We need to be on the alert for buzzwords that seem innocuous, but are actually concepts that are sinister and agenda-driven. Big Science doesn’t have a public relations problem. It has a propaganda problem. To hear science journal editors and science news reporters, you would think the gods are angry at stupid people. For example, on Live Science, Stephanie Pappas purports to explain “Why Americans Deny Science,” taking hold of the Yoda microphone to berate the unwashed masses. It’s not that the issues of “evolution, climate and vaccines” do not deserve informed discussion, or whether a fraction of the populace believes dumb things. It’s that her elitist stance begins and ends with the attitude, “We’re right, they’re wrong, that’s the end of the story”. . . The U.S. has a science problem. Around half of the country’s citizens reject the facts of evolution; fewer than a third agree there is a scientific consensus on human-caused climate change, and the number who accept the importance of vaccines is ticking downward. But there are reasons to doubt the “scientific consensus.” Who says so? Members of the scientific consensus itself, that’s who. Consider these recent reports from the journals and mainstream media. I'd be much obliged if you'd finish reading the article. Just click on "Language Strangles Scientific Ideals".